To be honest, I only learnt about this novel after watching trailer for the TV adaptation. It was intriguing enough to make me reach for The Tenth Annivarsary edition, recorded with full cast. I was very impressed with he quality of this audiobook. The actors are very well chosen and read their roles really well. The novel start with a release of a prisoner called Shadow. He is allowed to leave a few days before the end of his sentence due to unexpected death of his wife. As he travels home for the funeral, he comes across a mysterious stranger who calls himself Mr Wednesday. Shadow is soon hired by the man as his driver, errand boy, and bodyguard. 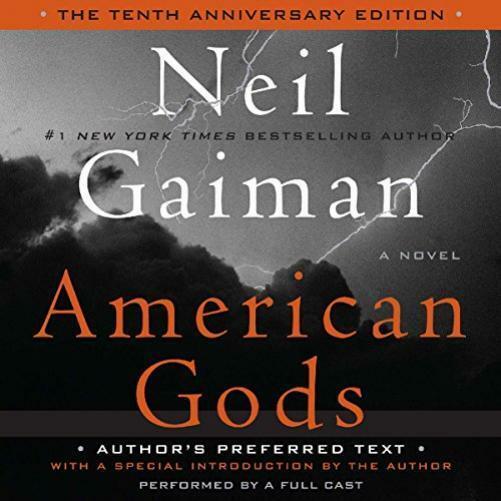 This simple story serves as a background for Gaiman's re imagining of the mythology of ancient gods who still exist in America. Mr Wednesday hopes to recruit them to help him in a fight against new gods. The new gods are manifestations of modern aspects of life such as technology, media, men in black. While Shadow should probably be overwhelmed by the situation, he just calmly takes everything in stride. His calm attitude stands in big contrast with the new, supernatural reality that he discovers. I liked this idea as thanks to that Shadow serves as a good focal point of the novel, and also a kind of filter through which the story is presented. 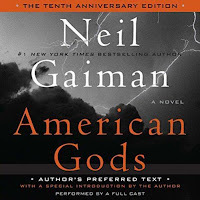 Gaiman skillfully adapts old beliefs and mythological beings and dresses them in modern clothes. Most of the story shows backroads Americana in its calm and peaceful glory or in complete dilapidation and this is another great strength of the novel.